While running a retail business, the most crucial task is to convert a visitor into a buyer, either it’s an offline store or an online e-commerce store. And to make a conversion, these online stores try almost everything from creating a perfect home page to implementing a smooth checkout process. As more and more buyers are now choosing to purchase online, the e-commerce websites have also geared up for this shift. The competition in acquiring these shoppers has also been increased. In such a competitive market, even a slight improvement in conversion rate matters. When you shop online, you check the product’s appearance by just clicking on its pictures. Unlike offline stores, you can’t touch, feel and try the product while buying. When you visit any shop, you can physically analyze the look & feel of any product and then can make your decision. But, when you buy something online, the first thing that encounters with you is the image of the product. You see the pictures, examine its look, and then take the next step. So, it’s essential to add beautiful and real images of your products on the product page. Click pictures of your product from different angles so that your buyer can see each & every corner of your product. Always use a white background so that your product looks bright and bold. You can also add a video of your product to interpret its usage and style better. A simple video without any audio showcasing the product would work better. You can easily embed a video in your Shopify store. Make sure that the real product and its images or video should not be different. Always use actual pictures of the product. Do not try to show something else and sell something else. Trust is hard to gain once lost. Beautiful product images serve the purpose of showcasing your products but at the same time introduces a new set of performance problems. That doesn’t mean you should shy away from using beautiful pictures instead read our blog post to learn how to optimize images in your Shopify store. Customer reviews can do wonders for your products. A long list of features and promises is not valid if there is no social proof of your services. 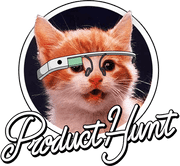 When a prospective buyer visits your product page, check out the images, features then they want to validate the same story by checking the reviews. Customer reviews tell the degree of excellence in your services. Do you deliver your promises or not? Is the product fulfills all you have written there or not? Your buyers can get all these answers by checking what people say about that product. These reviews are the best way to gain the trust of the customers. This shows the transparency of the seller and other people’s opinion about your services. 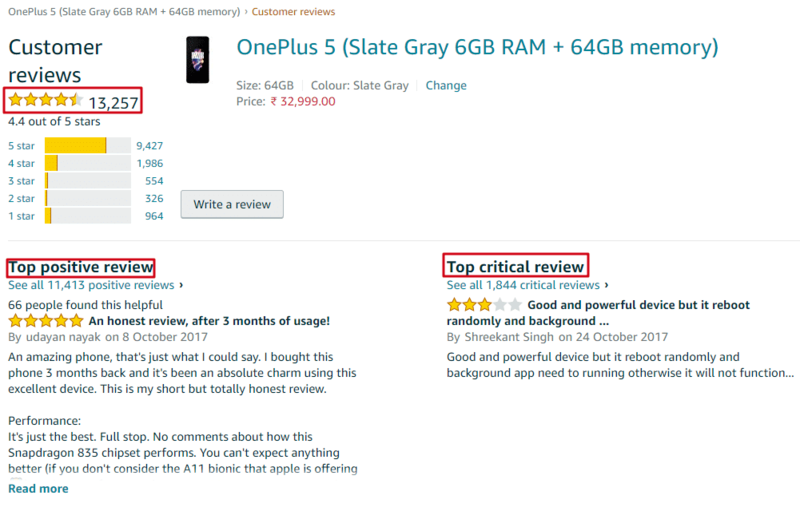 Check a different way of adding customer reviews on the product page. Source: Rent the Runway – An online dress rental portal. Most of the e-commerce websites allow customers to leave the reviews. Customers can share their experience by adding the image or video also. Customer reviews are also the best way to generate user content. User-generated content also impacts the ranking of your website, and you grab some SEO benefits. These reviews also make your brand’s social appearance strong. A good number of reviews is a useful indicator of how many people are interested in what you are selling. If you have just started your online store, you can personally ask your customers to share their feedback after purchase. If a customer has queries or doubts about a product while buying at an offline store, he or she can ask those questions from the salesman and get all the answers then & there. But when you provide an online shopping platform, you can’t be physically present there at the time your customer is making a purchase. So, if your customers resist buying a product because of some unanswered doubts, then you may lose a lot of conversions. To resolve this dilemma of your customers, you can provide answers to their queries by adding an FAQ section in your product page. Include some frequently asked questions and their answers and help your customers in making a purchase which will boost the conversions of Shopify store. The FAQs section should cover each & every query of the customers. 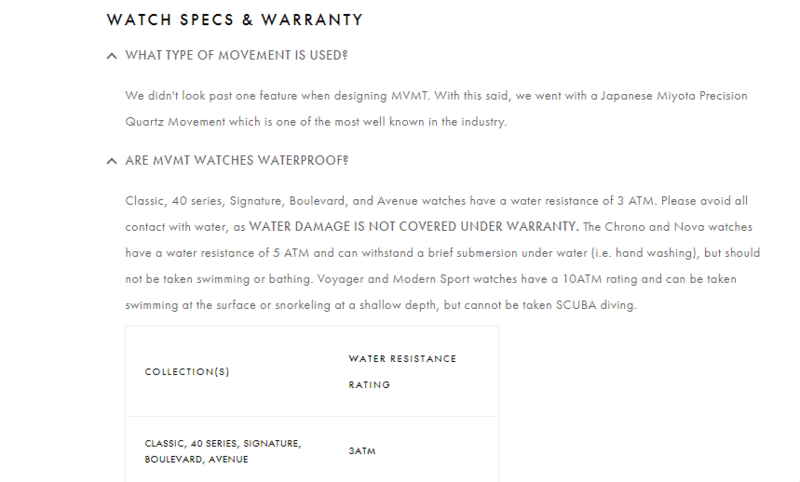 The example of mvmtwatches.com where the FAQs are categorized & answered beautifully. Always offer your customers an easy way to contact you. It can be a customer support number, a support email or a live chat option. If your customers are finding any difficulty while making a purchase, they should be able to contact you easily. Some businesses do not feel the necessity of having a live chat option. But it can do wonders for your conversion numbers. According to Forrester, the conversions of Wells Fargo increased by a double-digit when they integrated live chat to their website. Contacting on customer support number, waiting on the line or sending an email is a time-consuming process as compared to the live chat. Also, these are suitable for serious issues. But if a customer is having a short query or some doubt about your policies, then live conversation is the best way to get connected. 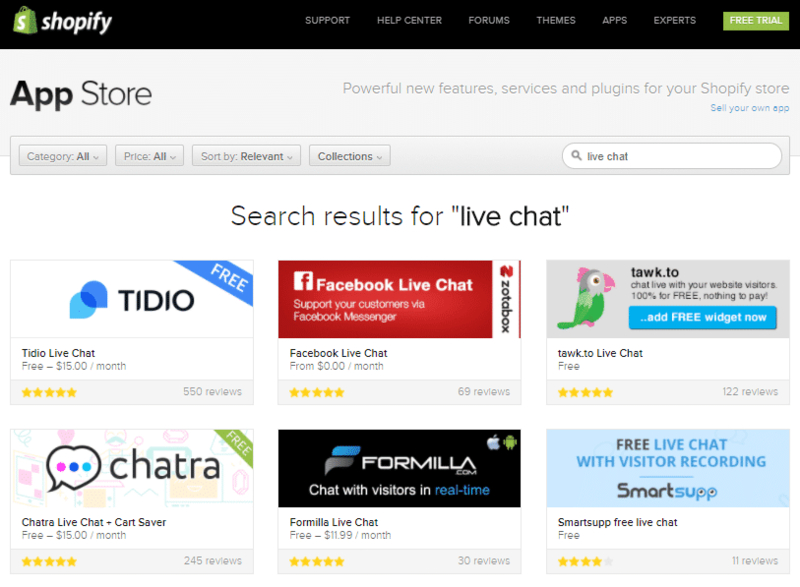 Live chat is a prompt & easily accessible way to post a query and get that solved. It gives a feel to your customers that you are always present there while they are browsing your products. There are plenty of live chat options in the Shopify App Store. You can easily integrate it into your website. While buying products online, a customer often debates on many points to prove his decision of purchase and return policy is one of them. Because when you buy online, you put your faith in the services of an online seller and orders the product without even trying it. So, it’s vital for the e-commerce sites to have an easy to understand & convenient return policy to win the trust of customers. 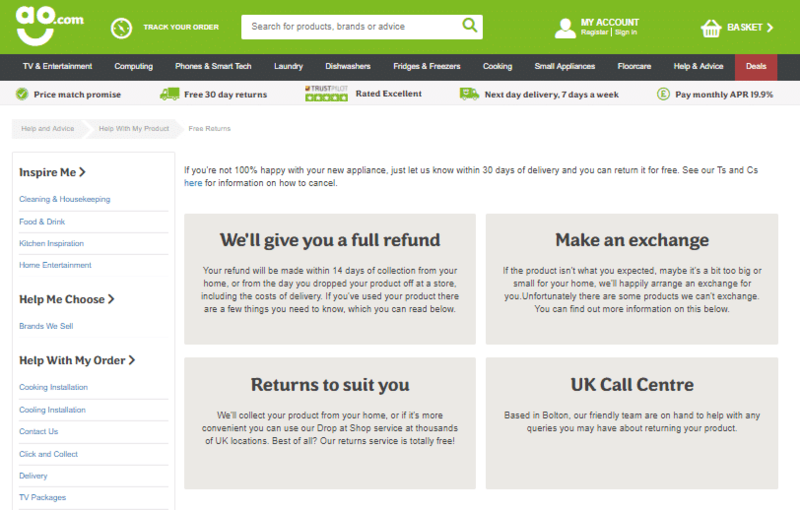 You should explicitly display your return policy, or money back guarantee terms on your product page. It shows that you are confident about the quality of your services and products. Your customers should trust your services and should not feel any uncertainty while buying from your store. In a return policy, you can offer complete 100% refund to your customers if you don’t deliver the promised services or you can provide an exchange policy. This will assure your customers and encourage them to proceed for check out. Let’s take an example of AO.com. AO or Appliances Online is one of the largest online retailers dealing mainly in appliances. It offers a convenient return policy to its customers including different ways to return a product like providing a full refund, product exchange, get customer care support, etc. The eCommerce industry is growing tremendously, and competition is increasing day by day. Thus, being a seller, you should keep experimenting with your product pages to provide an excellent shopping experience to your customers. Sometimes, even a small change can be beneficial. Your goal should be to remove all the hurdles from the path of your customers while they are in the process of making a purchase. So, always keep experimenting to stay ahead. Stay tuned to ImageKit for such amazing tips. Check out our other blog to learn some Shopify SEO Tips.